Ponteland is a village to the north-west of Newcastle - not far from where Newcastle airport is now. Cottage Homes were established there in 1903, initally taking in children from the workhouse which was to the west of Newcastle. 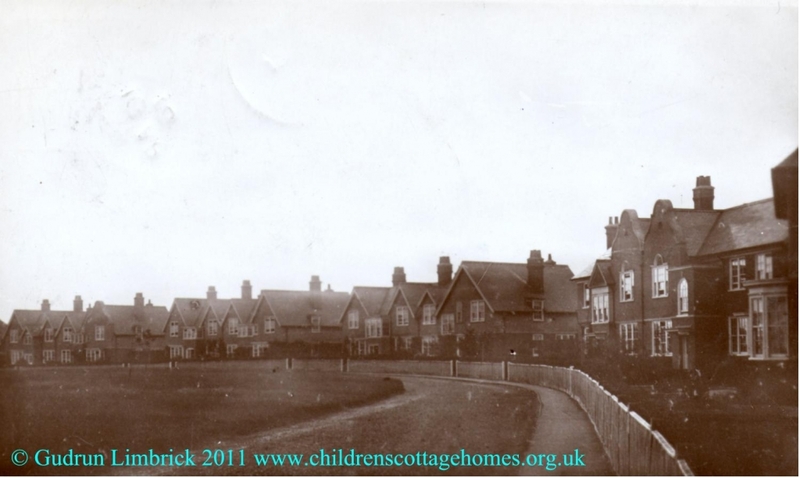 The cottage homes, built just out of the village on the road to Kirkley, were made up of around 14 large semi-detached cottages which together could house around 300 children at a time. There were workshops on site which would have been used for general upkeep and maintenance in the homes and also for training the boys in specific skills. A school was opened in 1914 by the Poor Law Guardians of Newcastle upon Tyne in Ponteland to take in the older children from the cottage homes. The building was later used for Ponteland First School before it moved in 2007. The homes closed in 1959 and the buildings have had other uses since including forming part of the Ponteland College of Education. We are grateful to http://www.pontelandonline.co.uk/html/ponteland_first_school.html and http://www.experiencewoodhorn.com/catalogue/ for the information on the cottage homes. We actually hold few records about the Ponteland Cottage Homes, mostly a series of recordings of interviews from the 1980s conducted with staff and residents of the homes (Ref: NRO 08542) anyone is welcome to visit us and listen to these in our study centre, we are open from Wednesday to Sunday between 10am and 4pm. Further details regarding access and opening times can be found on our web pages at http://www.experiencewoodhorn.com/collections/ On your first visit, please bring along one form of ID that shows your address, such as a driving licence or utility bill so that you can register to use the searchroom. Please note that there is a £3 charge for car parking and we stop producing documents at 3:30pm. "I was born on the 9th July 1942, weighing 9lbs, in the Royal Infirmary, Newcastle upon Tyne. It was a hot and noisy day with the German Luftwaffe pounding the docks by the Tyne. "My parents were poor, and although my Dad was blind, he was fully employed as a basket weaver at a works for the blind, along Wickham View, to the west of Newcastle, a job he kept until his retirement. My Mum was a bit poorly, small and thin, and loved reading cowboy books. My Dad smoked Condor sliced tobacco, and had to tease the slices on newspaper to break them up, until it was small enough to hand roll for his cigarettes. My Mum smoked Capstan full strength, I don’t know how because I nearly died when I tried them. "Dad worked at the same works all his life, he would get up have breakfast, walk up the street, catch the bus, then walk the rest of the way at the other end, not bad considering he lived in three different houses during his working life, Woodland Crescent, Rye Hill and Park Road then went back to teach after his retirement. During the blitz, he told me with a laugh, he used to take everybody home from the pub, because funny enough, he was the only one that knew where he was in the blackout. "My first 5 years or so at 21 Woodland Crescent, Benwell, Newcastle upon Tyne must have been happy, although I was pecked on the nose by a neighbour’s cockerel when I was three, my Dad said it must have been jealous. It was a ground floor maisonette, three bedrooms, and the bath was under the kitchen worktop, with the toilet and coalhole off the kitchen as well. And although they’ve pulled a lot of the houses down, 21 is still there today. "We were lucky to have Hodgkin Park at the top of our road, it was huge, the top park went up from Armstrong road to Benwell Lane, and the bottom park went down from Armstrong road to Whitehouse road, a little bit of greenery to enjoy. "Aged five, I was sent to the Cottage Homes, Ponteland, I don’t know if I went with the rest of my brothers and sisters or I went there to join them, as it turned out we were all there except two of my brothers who were evacuated to a farm at Ullswater because of the war. We did not see a lot of them until years later. "So my two sisters, a brother and I were left in this foreign environment. As it turned out, I was probably lucky, for the first two years I was with my sisters and about nine other girls and boys all in the same house No 10. All the houses were big semi- detached, and had big coal fed central heating boiler systems with big cast iron radiators. "Each house had the same layout, Best room, large lounge, large kitchen with walk in pantry, bathroom, separate room with sinks, back hall walk in cupboard room for shoes, coats, some cleaning stuff and outside by the coal house a row of six toilets for us. Upstairs there were two dormitories (six beds in each), one double bedroom and one single. "During this time at No 10 I can vaguely remember going down to our swimming baths on a hot sunny day - a full sized baths down the field behind No 10, and the building was made from corrugated iron. "When I was six, I went to No South 1 to live with eleven other boys of all ages, Mr Willy (he was in the Navy during the war) and his wife (to be called Mum and Dad) looked after us as foster parents, and they had a daughter who lived there with us. He was the Cottage Homes carpenter and was kept very busy. "At five we went to school in the homes with my friends Les and Colin. Actually at six, I could throw a stone from South 1 and hit the school it was that close, but we only went there for a couple of years or so. In the evenings the school hall was turned into a cinema, and everybody watched black and white movies, sometimes even plays. "Then by winter 1947, (I can remember going to Sunday school through the snow as happy as Larry but I don’t know why), the roads were closed because of snow drifts but we still had to go to Sunday Morning Service at the Methodist Chapel, Ponteland and come home for lunch then back again to Sunday school, and collect our icon stamps to stick in our books, six miles a day. "My sister has since told me that we stayed at the Homes school until we were seven, but after that we went to the village junior school which was still six miles a day. The junior school has since been pulled down, and is now a flower and lawn garden with seats by the banks of the river Pont. "As soon as I went to South 1, I found out that everybody had jobs to do, which usually took about half an hour, and you might have three or four each day. I can remember lighting the fire in the front room where everybody ate their meals; washing or drying dishes; cleaning twelve pairs of shoes in the evening and each room in the house had to be cleaned including the outside toilets. "At eleven we went to the senior school and the dreaded 11+, and learned all about Bonny Prince Charley coming north through Ponteland, and staying at the Blackbird Inn across the road from the Norman-built C of E church. There’s supposed to be a tunnel between the two. "I was always surprised when the school holidays came around, nobody said anything, I mean it never entered my head to look forward to them, they just arrived. Maybe everybody was the same as me and just as surprised. Except for Easter, we knew about that because we had to go to the C of E church in the morning for a service. The school is still there today, but the playing fields have shrunk. The last time I was up there I noticed it was for sale. "Every summer they took us all from the Homes to Scotland in five charabancs for two weeks during the holidays, I can remember Aberfoyle, The Trossachs, Falkirk, Dundee, Glamis Castle, Sterling, Perth, and Peebles which we passed as we went north or south, and of course there were no motorways in those days. There was plenty of swimming and hill climbing on these holidays, and I can remember always sleeping in double bunks in wooden spider shaped buildings in woodland, and plenty of hills and Lochs. "As I was in south1, my brother ended up in North 2 with the Homes Plumber, a man I did not come into contact with. I cannot remember going into the other houses, or inviting others into ours. Maybe there was a rule about it that I have forgotten. I did not see a lot of my brother because being two years older than me, he had his own friends, but I can remember playing or being with him around the Homes in the school holidays. "When I was about seven, he must have been nine, he was playing football with his friends on the playing field and they lost the ball over a barbed wire fence into a ploughed field and sent me to get it. I know I did not want to go, but he made me and I went and got the ball and threw it back. Then I cut my trousers on the barbed wire trying to get back on my own, because they were playing football. I can remember Mr Willy being furious with my L-shaped cut when I got back indoors. Clothes never have a little cut when you catch them, it’s always a big L shaped one. "I think the playing field at the Homes were about six acres. with one set of swings. The houses surrounded the field, i.e. 14 semis and the super's on the north side, with a road running all around them, and four semis and south house on the south side, with the road coming from the gate around the front of the school behind south house and south 1 to 4 to a dead end. "All the houses had front gardens and back yards, the cobbler's was on the west, and the school on the east, the carpenter's shop was between and back from the school and south house. The farm manager lived at the other side of the road from the school, on the north side, and the entrance gates were between them. The farm buildings were north and behind again from the super’s house. I used to love the smell of the grass when it was cut in spring. "In the Summer holidays we had five weeks - two in Scotland, and three in the Homes. We used to run down the drive, which was about 200 feet long, then up the road for a couple of miles, then across the fields to a bend in the river Pont which had a nice sand and fine gravel bottom, and spend a couple of hours swimming there. There were usually just two or three or maybe six of us together, never large groups. The village was named after the river, Ponteland. "Other than that I used to like helping Mr Willy in his carpentry shop, and I can remember breaking the blade of one of his hand saws, probably because I did not get a good hiding afterwards, he just looked at it and had a funny look on his face, and then it was all forgotten. We used to go to most of the houses to help him with his work. "About this time I can remember watching the Grove Family on black and white TV with everyone in the best room. I also watched the Queen's Coronation in June 1953, but I can’t remember where. "When I was 12 or 13 Mr Willy retired, he left in the morning with his wife and daughter, then when we were supposed to be in bed the same night, we watched Mr & Mrs Wilson arriving, funny enough with theire daughter. She was more my age. "I only had one job on Saturdays, and that was a job I did for both the Willys and Wilson’s, a regular Saturday morning walk with their little dogs to the village to buy their special groceries, another three mile walk, I don’t know why I was singled out for this job, but I always did it. The other boys said they would rather be dead than be seen walking the dog, but I would rather be walking the dog than doing all the other chores they had to do. "During my early teens I joined the scouts with the rest of the gang. We would go into Ponteland once a week in our uniform’s with our Mounties wide brim hat, and learn all sorts of things - the scout code, knots, wood craft, cooking outdoors, and lots of other things that I’ve forgotten about. For my 13th Christmas, my Dad gave me a Crystal set (cat's whisker) with earphones, and I could listen to the radio, and on my 14th Christmas he gave me a bicycle, which he pushed from Ponteland, but how he got it there I just don’t know. Mr Wilson turned out to be a carpenter as well, and he’d been in the Black Watch during the war, and next door in South 2 the man (he used to run the grocery store, and cut our hair on Saturdays) had been in the Army too, and we used to have regular war story evenings. "The children and staff had regular turn rounds i.e. coming and going. All the children left as soon as they were 15 and the staff when they retired. Mr Wilson could be tough; I did not mention earlier that he was the Regimental Sergeant Major of the Black Watch, but in some ways he probably treated us more like his family than anything else. He could drive and had a little car, and when the Homes got a new Morris mini bus, Mr Harrison asked him to drive it. "In the Homes we had a small farm. In season we could go and pick gooseberries, raspberries and so on, we grew our own vegetables, and went to the back of the superintendent’s house for the rest of our groceries. It was like an old fashioned shop, everything in sacks, and it would be weighed out into brown paper bags. "The superintendent was Mr Harrison, he lived in the biggest detached house in the Homes. There were two detached properties in the Homes, the other was South house next to ours at South 1. All the other houses were semi detached. "When I was thirteen, my brother left, and he got a job on the slaughter house farm I passed on my way to school. I did not see him every day, but two or three times a week seemed to be enough at that time. Just before he left they built a 500 council house estate, from the back of the farm he was going to work at, right across the back of the school playing fields and to Ponteland village, more than doubling the size of the village at that time. "Mr Wilson helped us to build an aviary outside the carpenter's shop, and we kept pigeons. I can remember we seemed to have more freedom in those days, we would go to friends' houses from school or Sunday school, I can remember going to my friend’s house. I remember going to one friend's house in Summer and we played cricket on the lawn and had a smack up cream tea afterwards with probably two or three cakes. At the Homes we only had one cake a week, which was after Sunday tea. "There’s actually a very large hall at Darras Hall, where we sometimes were invited down in the evenings to watch repertory. Can you imagine 30, 40 and sometimes 50 of us walking in the dark in threes like soldiers? But it was better than films. We always thought Darras Hall was a bit upmarket, where the toffs lived. "When I was 14, I was allowed to go home to Newcastle every other weekend and return Sunday night. Maybe this was because my parents were finding it hard to visit me at the Homes, as they had done about once a month or so all the way through my years there. I can remember my mother taking me to the Rialto cinema along Armstrong Road for the afternoon matinee, going to the shops, library and visiting the neighbours while I was home. And then at 15 I left the Homes to go to work. 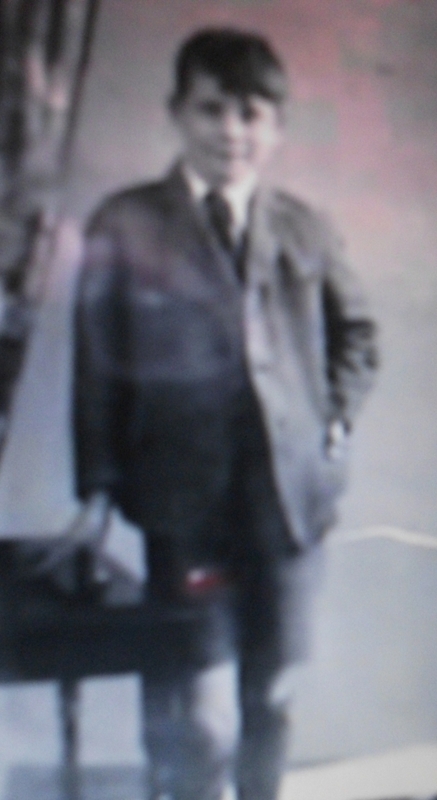 In the summer of 1957 I went for the very first time by steam train to Eggington, Derbyshire."